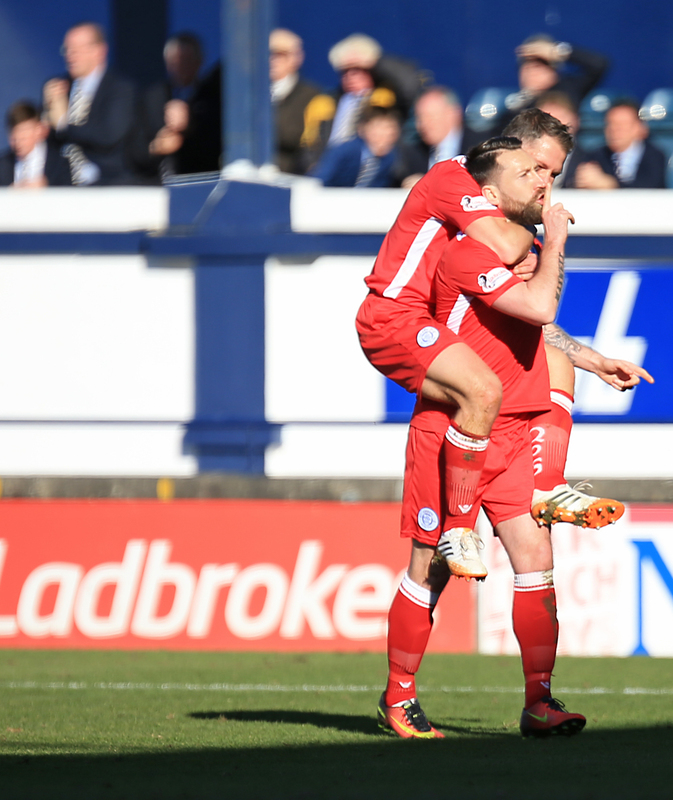 It was far from the most entertaining game we`ve seen all season, but Queens returned from Kirkcaldy with a hard earned point gained in controversial circumstances, having gone behind early, which may yet prove vital. 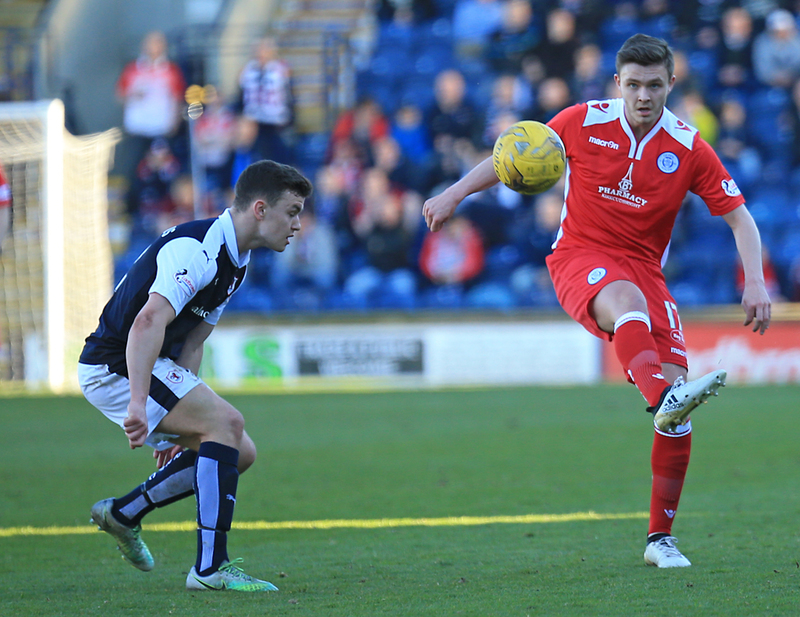 Gary Naysmith made three changes to the Queens side beaten at home by St Mirren last weekend. Regular keeper Lee Robinson was fit again so Jim Atkinson returned to the bench whilst Darren Brownlie returned from suspension and Derek Lyle also came in to make it an out and out front two alongside Dobbie. Dom Thomas and Lyndon Dykes dropped to the bench as the side started in an unfamiliar looking 3-5-2. New loan signing Connor Mcmanus had to make do with a seat on the bench where Dale Hilson (minor knock) and Jamie Hamill (illness) were missing. The home side were along expected lines and Conor Brennan was able to return to the bench for the first time since being injured at Palmerston last month, giving them a squad with two goalkeepers for the first time in 8 weeks. Although Stephen Dobbie earned a couple of corners in the opening minute, there had been no threat of a goal at either end before Rovers opened the scoring in the 10th minute. Jason Thomson seized on a poor clearance and played the ball forward to Ryan Hardie who had found himself some space between Marshall and Higgins and the on loan Rangers youngster made his way into the box before slipping the ball beyond Robinson into the net from about 12 yards. Midway through the half Andy Dowie was perhaps slightly harshly booked for a challenge on Callahan and a minute later Jason Thomson was controversially booked for the home side for a challenge on Jordan Marshall. 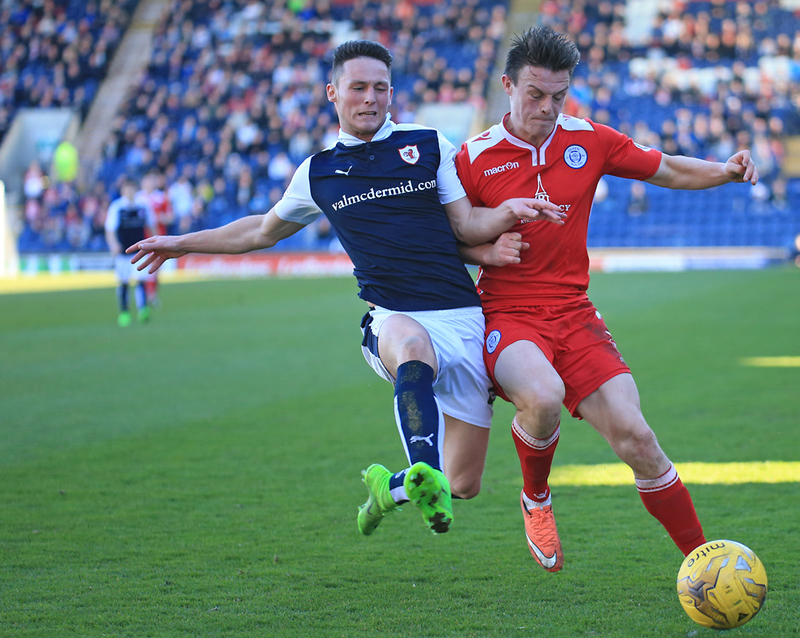 Although the Raith skipper had clearly won the ball, he had rather jumped in two footed at the left back and, if it was given as a foul, he was perhaps fortunate it wasn`t seen as worth more than yellow. The equaliser arrived on 24 minutes. Derek Lyle slipped a through ball into the box for Joe Thomson beefore being clattered by Benedictus. Thomson was flagged offside but referee Mr Steven had already given a free kick for the late challenge. Stephen Dobbie stepped up and from 25 yards out sent a wonderful curling effort off the post and then goalkeeper before the ball bounced on or just behind the line and then back out. Rovers were adamant it hadn`t crossed the line but for me at the time it looked like it had. We`ll await some video evidence which hopefully will be more conclusive but Mr Steven and his assistant awarded the goal and `Dobs` celebrated his 20th of the season and 75th of his Queens career. 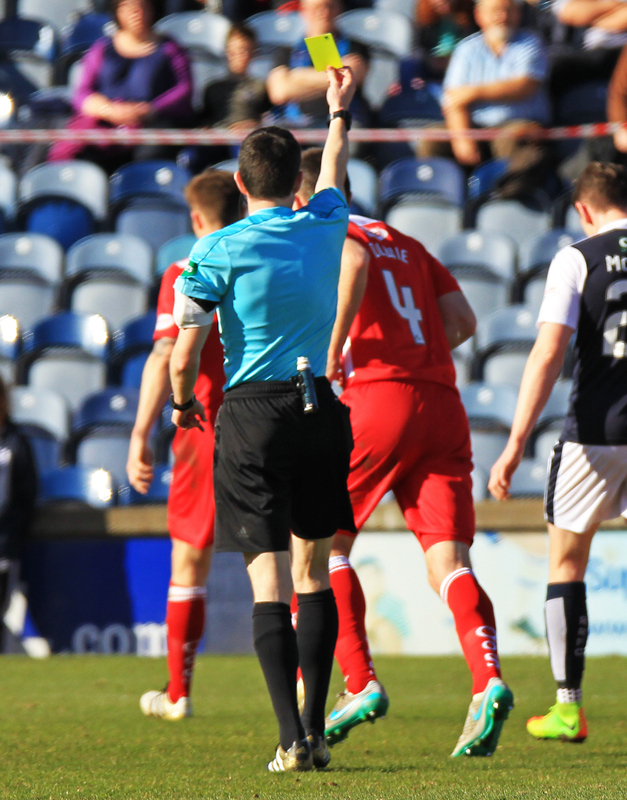 There wasn`t another shot worthy of mention in the first half but there was another bad foul leading to a booking as Ross Matthews picked up a yellow card for a challenge on Lyle so late Easter almost arrived first! The ball had seemed to spend more time in the air than on the ground from both teams first half and the second period proved to be little different though it was perhaps marginally better. A Higgins header at goal was blocked and a minute or so later Lyle`s effort following a corner was parried away before Declan McManus became the third Rover booked for a cynical pull back on Thomson. Darren Brownlie was perhaps fortunate not to follow him into the book for pulling back Craig Barr soon after. Perhaps the difference being Brownlie committed his foul in the opposition box at a set piece whilst McManus pulled back Thomson to stop an attacking break towards goal. 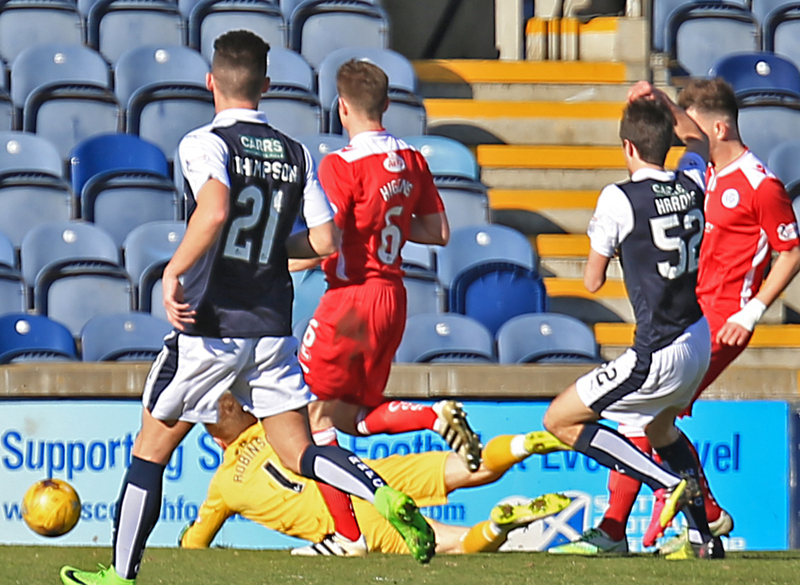 The main talking point of the second half was Raith`s claim for a penalty midway through when Callahan went down under challenge from Higgins. Higgins certainly got nothing on the ball but it would have been a soft award I thought, with the Raith player more running into him than actually being fouled. Perhaps an obstruction? To be fair to both managers, whilst the quality wasn`t good, neither of them was looking to settle for what they had. John Hughes used all three subs early with Skacel, Roberts and Bobby Barr replacing Johnston, Benedictus and McManus. 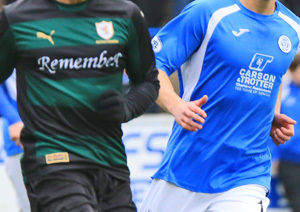 For Queens meanwhile Gary Naysmith replaced Scott Mercer with the more attack minded Dom Thomas whilst Connor McManus replaced his Celtic team-mate Joe Thomson. 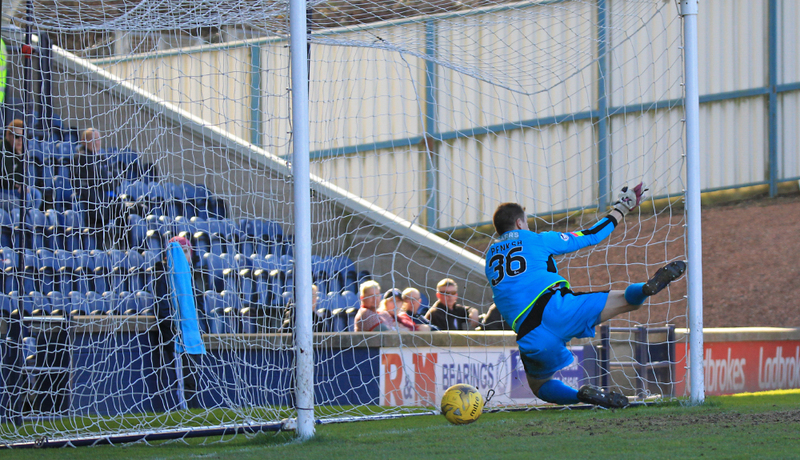 Lee Robinson made a comfortable enough save from Craig Barr before the subs were completed when Dykes replaced Lyle. As the minutes ticked down you couldn`t help remembering Raith`s 93rd minute winner out of the blue on our last visit but there was to be no such late dram from either side this time. In truth after such a poor game overall it would probably have been a travesty if either team had actually won it. The draw seemed fair enough though doesn`t do massive amounts to help either. With Dunfermline winning at Morton our hold on 5th spot is ever more precarious and Ayr`s win over Dumbarton means we are now only 5 points clear of the relegation playoff position, albeit the goal difference is probably worth an extra point. we could do with a couple of wins to make sure of our status as soon as possible. Next at Palmerston it`s Dundee United, fresh from winning the Irn Bru Cup today and still chasing promotion through the playoffs, albeit on a poor run themselves. Half Time A fairly even half with few chances at either end comes to a close.